The world’s largest mixed martial arts promotion will be holding a press conference Wednesday at Flames Central in Calgary, Alberta, Canada at 12PM local time (11AM PT/2PM ET). 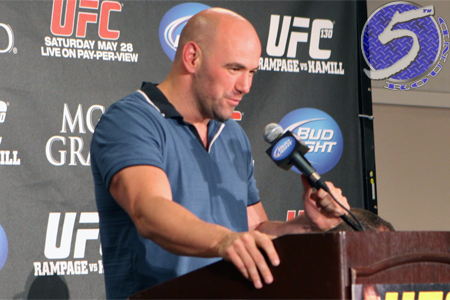 UFC president Dana White (Pictured) and UFC director of Canadian operations Tom Wright will be at the podium. All indications point to the Octagon confirming they will be taking their talents to Calgary on July 21st. White’s tweet Tuesday afternoon all but sealed the UFC 149 deal. “Calgary has been waiting for a UFC event for a long time,” White posted. The organization’s debut in Calgary is expected to take place inside Scotiabank Saddledome. According to the trusty rumor mill, it’s possible featherweight king Jose Aldo might headline the show. The UFC has held eight shows in Canada – four in Montreal, two in Toronto and a pair in Vancouver. UFC 129 at Toronto’s Rogers Centre sold over 55,000 tickets for gate revenues exceeding $11 million. The April 2011 event shattered MMA attendance and gate records in North America.